A neutral pH translucent and nonabrasive, coated paper. 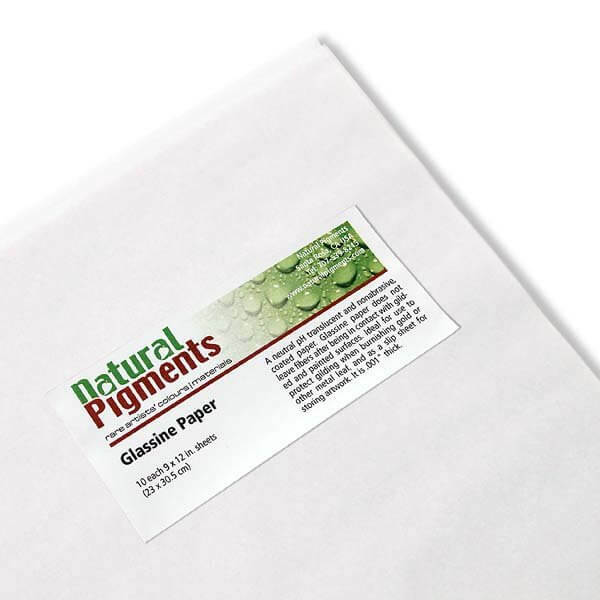 Glassine paper does not leave fibers stuck to a surface after being in contact with gilded and painted surfaces. Ideal for use to protect gilding when burnishing gold or other metal leaf, and as a slip sheet for storing artwork. Always allow at least a few hours after you've applied the gold leaf to the gilding base to do any burnishing, and even then test the quality of your gold coverage. Waiting allows the leaf to securely adhere to the gilding base, and allows the base to dry so that it will not be damaged by the pressure applied during the burnishing process. Take a small square of glassine paper, cover the gildered area with it, and while holding it down with one hand, rub a side of the burnisher lightly over the surface of the gilding with your other hand. Burnishing with the glassine paper helps you find any uneven area on the surface, that is small spots where the gold might not have adhered well or where less gold adhered than in other areas. After burnishing these spots will appear as dark patches through the glassine paper; the paper helps you to see where there are spots or irregularities in the gilding. Repair any faulted areas or uneveness by adding more gold. After twenty-four hours the gilded area is dry enough to withstand direct burnishing. Begin by again burnishing through the glassine paper to test the hardness of the gesso. Hold the paper and the burnisher in the same manner as described earlier, and apply increasing pressure onto the surface of the gilding, feeling for any softness or tackiness in the gilding base. When you are confident that it is quite dry, you can burnish directly onto the surface of the gold, applying at least as much pressure as you did when polishing the gilding base surface.